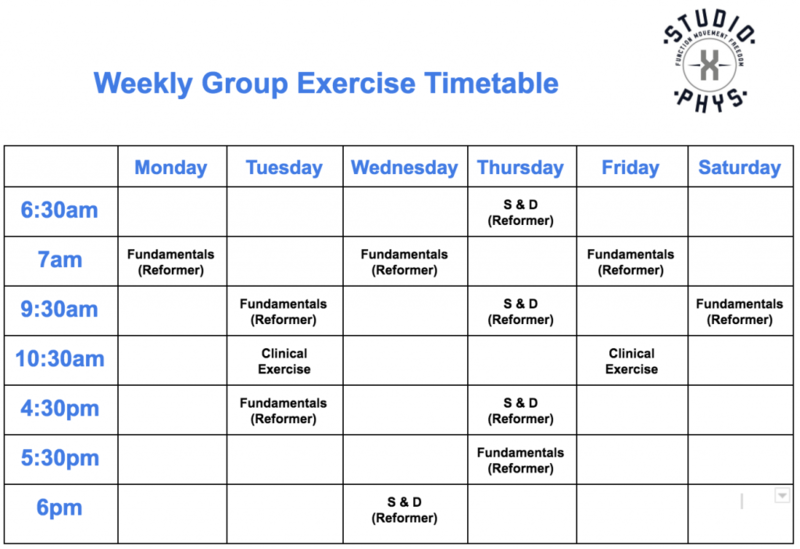 Fundamentals (Reformer) (50 mins) – Our signature reformer class. A full body Pilates Reformer workout utilising the principles of Pilates to gain strength, mobility and flexibility. Suitable for beginners to advanced with modifications. Not suitable for people with acute injuries (see clinical exercise), or if you are pregnant. Maximum 5 people. Strengthen and Define (Reformer) (50 mins) – This mixed equipment exercise session features contemporary Pilates exercises using the reformer, trapeze tower, jump board, weights, pilates rings, balls and bands. An intermediate session to challenge fitness, strength and endurance.Not suitable for people with acute injuries (see clinical exercise), or if you are pregnant. Maximum 5 people. Clinical Exercise (50 mins) – Taken by an Exercise Physiologist or Physiotherapist with Pilates Qualifications. This is ideal for anyone with an injury, health condition or someone who wants an individualised program. The classes use a mix of equipment including reformer, weights, trapeze tower, bands and balls. They are based on your injury, condition and goals. These classes require an initial consultation before the class and a private review session every 12 weeks. Maximum 3 people. Private health Rebates available. Classes are very personalised & tailored to suit any level. Bookings are essential & Pilates is popular & filling up quick, I recommend securing your ideal time ASAP. Any questions? Please don’t hesitate to ask, we are here to help. TO MOVING WELL & FEELING GREAT!